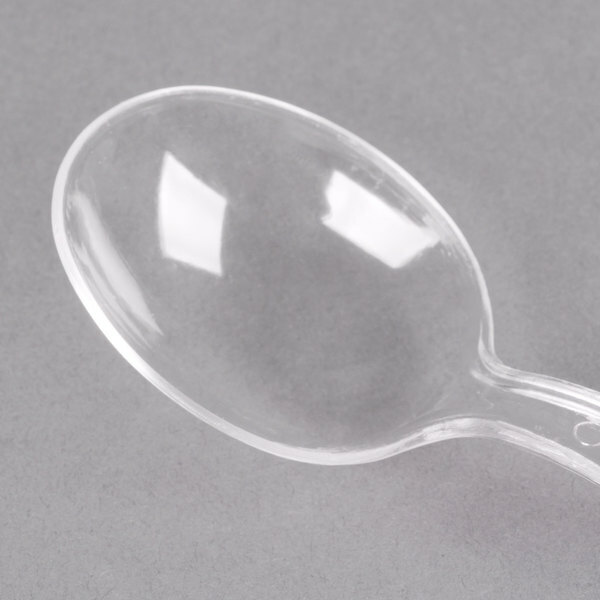 Enjoy the ease of disposable flatware with this Visions clear plastic soup spoon! 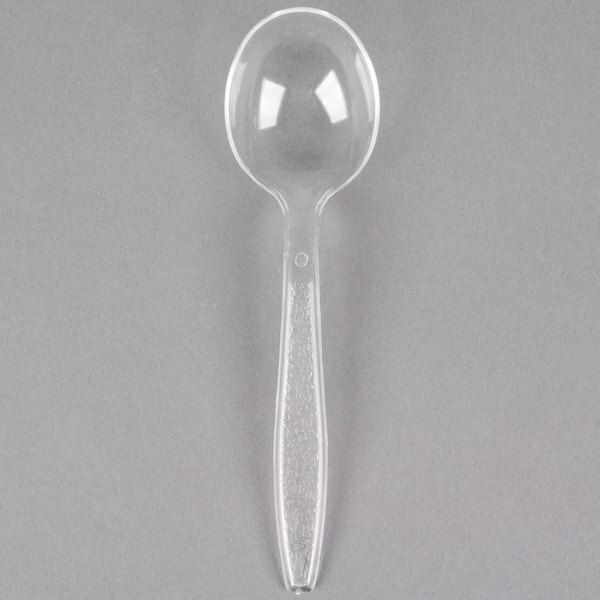 Perfect for your take-out restaurant, cookout, party, gathering, or other catered event, this Visions clear heavy weight plastic soup spoon will exceed your serving needs! 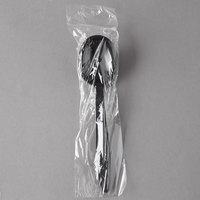 Complete your plastic cutlery setting, or use it to fill your flatware bins at your snack shack or concession stand. "I love this product. 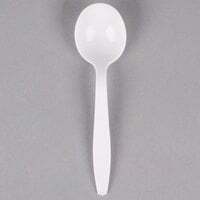 These spoons are unbelievably sturdy. 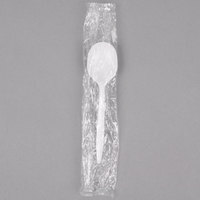 I reused these spoons several times. I would definitely repurchase this item again. This was sold at a great price"
I actually ordered these soup spoons in error thinking I had ordered regular spoons. I was not disappointed however because they are sturdy, attractive, and they can be used for both purposes. Getting high quality disposable utensils like these is a good idea for any catering company who cares about their clientele. These puppies stand up too high temperature soups and don’t feel flimsy in your hand. Getting high quality disposable utensils like these is a good idea for any catering company who cares about their clientele. 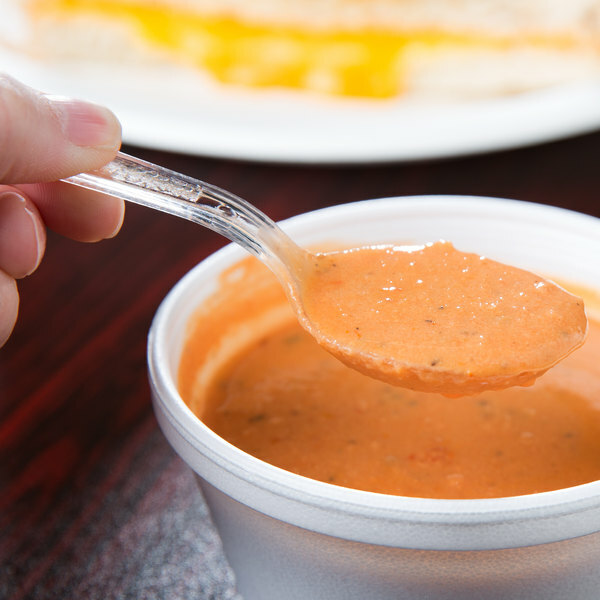 These puppies stand up too high temperature soups and don’t feel flimsy in your hand. This item you won't find just laying around your plastics aisle at the grocery, most big box stores don't carry them. I cannot tell you how much better soups and stews travel from bowl to mouth with the right tool! They all match the visions clear line of forks, spoons and knives and present wonderfully. These spoons, though plastic, seemed heavy duty and were great at our event. They are much nicer than regular plasticware, and appeared clean and classy. Our team highly recommends using heavyweight plastic cutlery. Heavy weight plastic cutlery is much better quality and will last longer than light and medium weight. 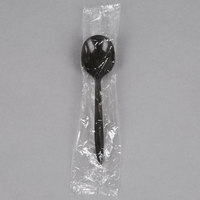 It is difficult to find soup spoons at our local store so we purchased them here on the website. 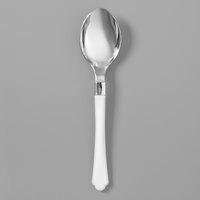 I really love these spoons . Sometimes with plastic forks they can be a little rough around the edges and cause discomfort when eating from them, but these are perfect. The are smooth and hold up nice to Hot Soups. I would highly recommend these. These did not feel as heavyweight as some other plastic utensils I've tried, but they are plenty sturdy and looked very good at table settings. I don't remember any of them breaking accidentally, and the bowl was a nice size for eating hot soup. We LOVE these spoons. We order them for home use, and we go through them quickly in the fall and winter. They are perfect for informal gatherings and also for kids' lunches. Will order again and again. 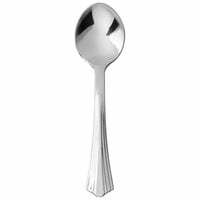 This is a very nice and sturdy spoon at a reasonable cost. We use it often for our more upscale events for a more elegant look! The Visions Clear Heavy Weight Plastic Soup Spoon is great for soup or other foods in cold lunches. The quality is very good as well as the price. I definitely recommend and will purchase again if needed. I love clear cutlery and love soup and bouillon spoons, I guess it's just my thing, and these have a lovely shape and really are sturdy, would recommend! 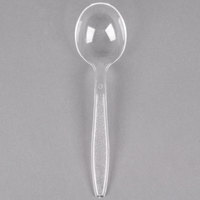 Thes clear spoons are great. 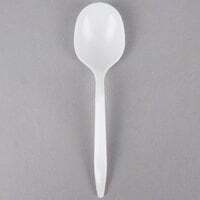 A heavy weight plastic spoon is always good to find. For birthdays, camping, or any event really. Another good find from Webstaurant! The Visions heavy weight product line are all very nice products. They feel sturdy, look sharp, and the price cannot be beaten. These are a great choice for both homes and businesses. Love this soup spoon. We needed a larger spoon for our soup and salad night at church. We tried several other soup spoons and decided on this spoon!! The boss loves it! 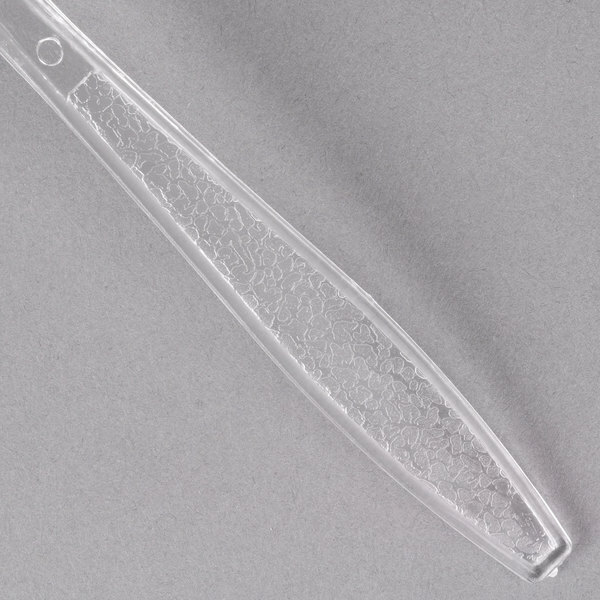 The Visions Clear Soup Spoons are durable and very strong. 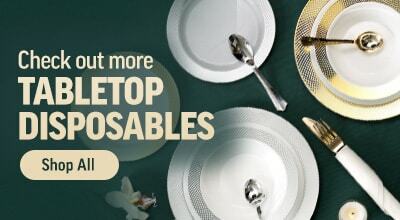 We use them with soups and other dishes and they never break. They are affordable and much better then what you could buy in the supermarket. I would recommend them. I bought these for a function where we were serving chili, and they were perfect. Very sturdy as well as economical. I will order them again. 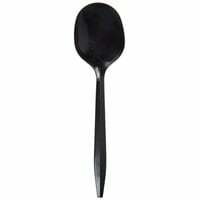 Great spoons for hot and hardy soups. They can definitely hold a lot of weight without being compromised. They come at a great price and worth it! 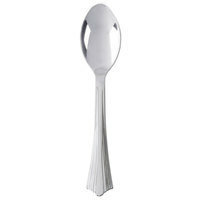 The spoons are a nice heavy plastic, no rough edges. My concern, the bowl was not quite big enough to be comfortable in your mouth. Not easy to get the chili out. Used the Visions Clear Heavy Weight Plastic Soup Spoon to pick up watermelon. Watermelon is filled with lots of water and the soup spoon had no trouble picking it up. Very sturdy. I was very pleased with these spoons. They are very sturdy. The great price was great. Definitely have been telling friends and family about my purchase. Customers love these spoons! What's not to love about a crystal clear design and the strength to handle our richest soups and stews! Thank you! 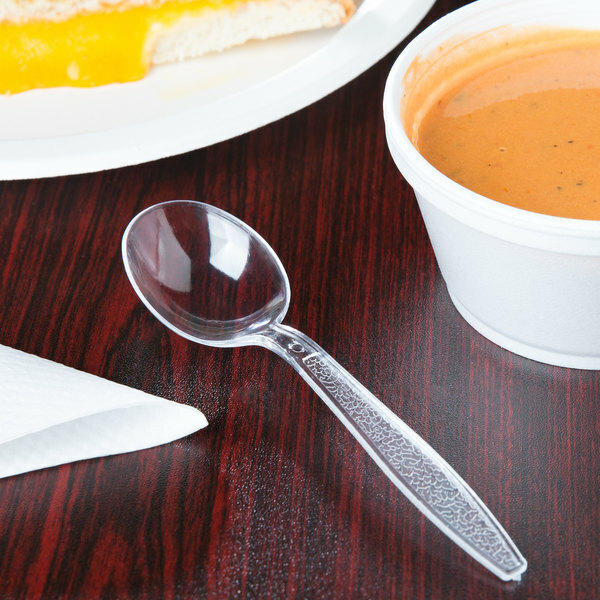 These soup spoons worked well with hot and cold items. They were sturdy and not cheap looking. Paired well with the knives and forks. Great value for the price! Nice heavy duty spoons. THe clear color is great for just about any soup, chili, ice cream etc. They hold up much better than the standard store bought type and cost much less. These are by far the best spoons we've tried. Great price, very sturdy and they look really nice too. Has some complaints about the flimsier spoons so we switched and couldn't be happier! 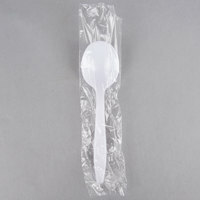 We have purchased sturdy plastic spoons like these at prices much higher at retail stores. 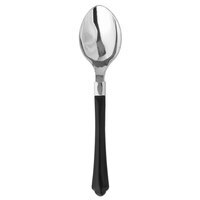 These hold up to eating hot soups, chilis, as well as spooning up ice cream. They do not bend easily like flimsier versions. On another note, Webstaurant has excellent customer service. By some fluke, we did not receive 100 in our order, but a quick and easy phone call to Web solved it instantly. An effusive apology, and a new order was sent to us immediately. We received it the very next day. And we did not have to go through the hassle of returning the spoons we already received. 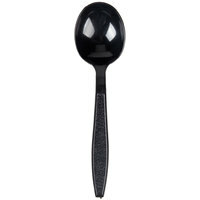 You can not go wrong with these very inexpensive soup spoons! They are great for offering samples of soup or even frozen yogurt! Best price on the web! !